Attorney Journal (aka Attorney Journals), San Diego Edition is a B2B trade publication produced for and delivered to private practice attorneys in San Diego County. Each month our publication strives to present interesting features profiling attorneys, vendors, community news and brief and in-depth editorials on topics that San Diego attorneys want to read. 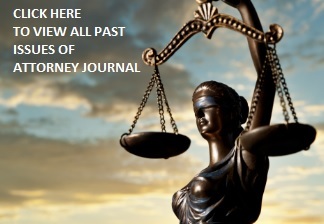 Attorney Journal has a controlled circulation. Our current readership consists of over 10,000 attorneys in San Diego County who are in “private practice." We also have an Orange County Edition which has the same controlled circulation and format (in Orange County) and can be found at: AttorneyJournalOC.com. Attorney Journal is produced monthly in 4-color, glossy print and digital formats. Our publication is distributed via U.S. Postal mail and the Internet. The online version of Attorney Journal is made available on our website and a monthly e-newsletter using digital software technology provided by ISSUU.com. Our readers rely on legal services and referral business to help them execute their work more effectively and efficiently. They rely on Attorney Journal to provide them with the information they need to make educated decisions on which legal vendors to use and which attorneys they should refer their clients to when a specific area of expertise is required. The editorials in Attorney Journal include an infinite array of topics, such as professional profiles, legal ethics, practice management, office management, marketing, technology, stress reduction, community news, and much more. The Attorney Journal’s dedication to high-quality editorial and modern design, along with its strong and controlled readership, focus attention on and lend credibility to the advertisers included in each issue. Your ongoing advertising in the Attorney Journal will build name recognition, preserve current market share, and persuade new business opportunities. Issue closing dates are typically the first Friday of each month for the following month’s issue. Feel free to inquire about any outside deadlines to submit new editorials and/or advertisements. Contact us at (858) 505-0314 for more information and/or to request advertising rates.